The return of the in-line six? All Dawoos (except for the Matiz) have up until now used powerplants borrowed from GM design or sourced from a GM subsidiary. But now Daewoo has announced the production of its totally new 125kW inline six cylinder engine, to be mounted east-west in the large Magnus saloon. The power plant, technically called an "inline six transversely-mounted engine", allows for a four-wheel drive system and makes huge gains in power and fuel efficiency possible, company officials say. 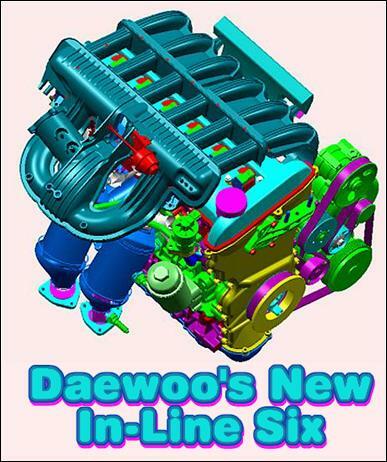 "With the success of the new east-west engines, codenamed L6 project, Daewoo has surpassed global industry giants, like Benz and BMW, in the six-cylinder engine segment, as these manufacturers have not yet developed an in-line six with the compact size and light weight of ours," said a company spokesman. Quietness in operation - The design features a full cast bedplate and aluminium structural oil pan. There is minimization of airborne noise radiation by the use of the compact design. 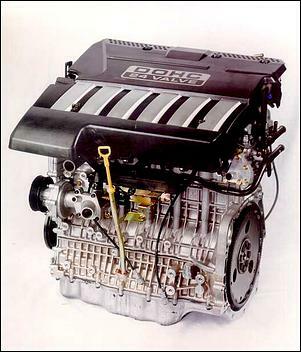 Environmentally friendly - The engine meets North American emission regulations (ULEV) by reducing hydrocarbons due to fast warm-up by the adoption of Silitec aluminium liners, reduction of non-combustible crevice volume by adopting 4mm piston top lands and a thin metal head gasket, and the use of close-coupled down-pipe catalytic converters. Compactness of design - The reduction of engine length by adopting 6mm bore bridges with Silitec aluminium cylinder liners and 12mm cam chain system gives an engine length of just 642mm. 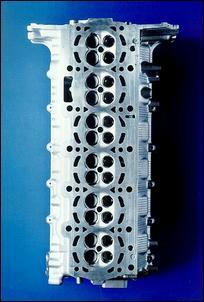 A narrow angle cylinder head reduces engine width. Lightest engine in class - By adopting lightweight materials, with an all-aluminium construction, plastic intake manifolds and tubular exhaust manifolds. Engine design reflecting recycling - All-aluminium construction and the use of recyclable plastics in manifolds and engine covers. Daewoo's engineers state, "What we had to deliver was refined power expressed as a blend of performance feel with excellent low and mid-range torque to give acceleration without strain, combined with a quiet but pleasing sound." 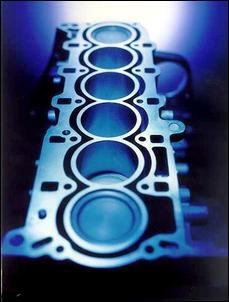 The foundation of the engine's refinement is a strong, stiff cylinder block. 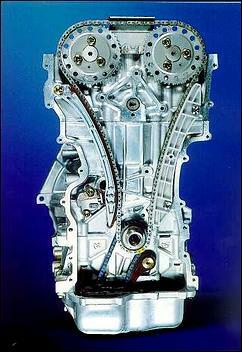 The main part of the XK6 block ends at a face level with the middle of the crankshaft's main bearings, like most traditional sixes. 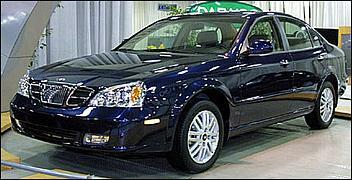 But instead of the part below being a pressed steel oil pan, which contributes virtually nothing to the stiffness, Daewoo uses another casting that forms the caps to the main bearings, giving a bridge-like bedplate. To that is bolted a structural cast aluminium oil pan. Replacing individual main bearing caps and a thin pressed steel sump with such extra castings in effect makes the cylinder block structurally deeper, which allows the block to bear much higher internal loads and stresses without vibrating. This is important in any engine design intended to be quiet and smooth, and even more so when the designer demands high power. Other technologies used within the design of this engine are fracture-split connecting rods, iron-coated pistons and the use of Silitec aluminium cylinder liners. The engine weighs 148kg, in both 2.5 and 2-litre forms. The dual overhead cam drive is by chain, while the valves are operated through roller rockers. The plastic intake system is of the variable geometry design, with direct-fire ignition is used. There are numerous other features of this design, which was the brainchild of Dr Ulrich Betz. One of these features is the modular design of the engine, which allows 3, 4 and 6 cylinder derivatives of this engine to be manufactured, with capacities from 800cc up to 2500cc. The six-cylinder design will allow 1.8-litre and 2-litre capacity variants to be produced, each with the benefits of compact design, excellent performance and silky smooth characteristics. "With Daewoo changing to its own engines, large savings can be made, making the company much more profitable," officials have stated. "An annual production of 30,000 east-west engines will save Daewoo about A$58.8 million," the spokesman asserted, adding that the new engine was developed at a cost of A$72.85 million over the past seven years. Daewoo has also built an advanced experimental version of the 2.5-litre inline six fitted with an electromagnetic valvetrain and an automatically shifting six-speed mechanical transmission. 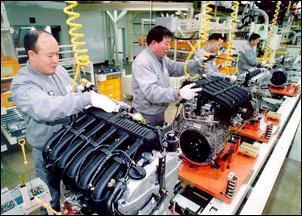 A state of the art engine assembly plant to build the new inline-six has been constructed within Daewoo's main manufacturing complex in Bupyyeong, west of Seoul.